This isn’t so much a recipe as it is a recommendation for things to buy at Trader Joes. My husband and I are doing a Whole 30 right now. A Whole 30 isn’t all that different from how I normally eat. It is basically strict paleo with No Sugar, No Dairy, No Paleo Treats, and No Alcohol. All it does is really help you focus on resetting your tastes, especially when it comes to SWEET things. So usually we get some things at the grocery store that are pretty much paleo, but have some sugar in the ingredients. Stuff like sausages, bacon, bruschetta sauce, salami, etc. So, in an effort to find some quick food for my kitchen “lazy” husband, I stumbled upon a tried and true Trader Joe’s staple. Carnitas. This little package of pre-cooked carnitas has been on the Trader Joe’s shelves for as long as I can remember. So it must be pretty popular if it hasn’t gotten the dreaded TJ’s “discontinued” status. And fortunately for us, it doesn’t have any sugar in the ingredients. I threw it in my bag along with some applegate hot dogs, garlic herb sausages, organic marinara sauce, and spicy pico de gallo. Once home, a breakfast idea was born. So head to your nearest Trader Joe’s (or your nearest carnitas supplier) and whip up a yummy breakfast. Add some guacamole if you’re feeling adventurous. Heat a skillet with a bit of butter or coconut oil until hot. Drop in some shredded carnitas, diced red onion, and cilantro. Stir every minute or so until the carnitas are sizzley brown and the onion is translucent. IN another pot, boil some water. Once boiling, reduce to medium heat (you want a gentle boil). Drop in the eggs and remove with a slotted spoon when the white is set and the yolk still a bit “soft”. 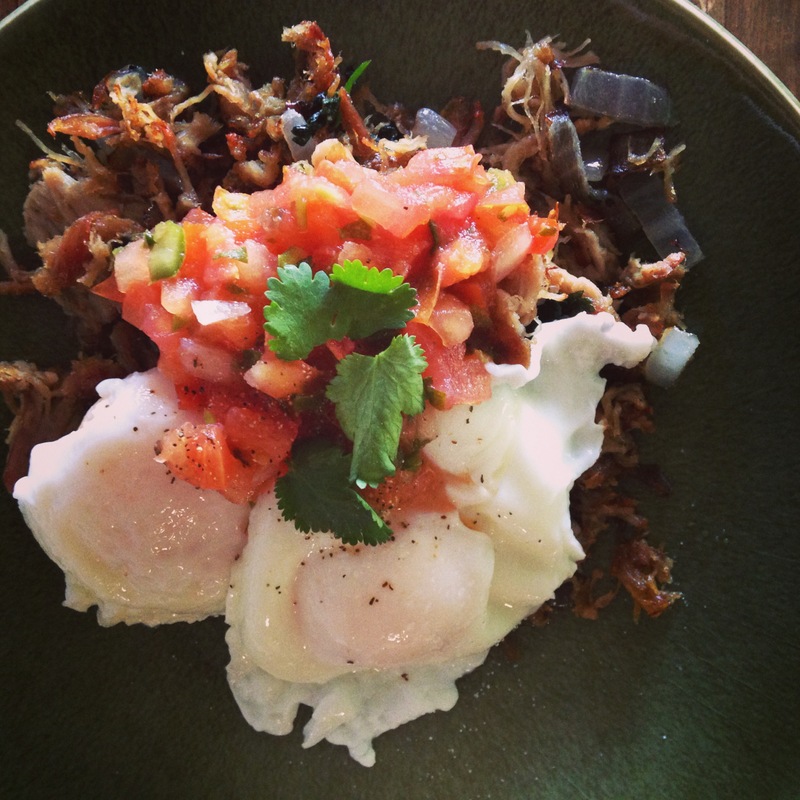 Serve the eggs over the crispy carnitas and top with some awesome salsa or hot sauce.